CVS will buy Aetna for $69 billion. Will the federal government approve the deal given its reluctance to allow big insurers to buy each other, especially since CVS has a strong pharmacy benefits management business in CVS Caremark and both companies have specialty pharmacy operations? How will CVS structure the combined companies to use its newfound vertically integrated clout? How will CVS’s pharmacy relationships with competing insurers be affected? What actions will diehard competitor Walgreens take or what acquisitions might it consider? Was the proposed acquisition driven by Amazon’s interest in the prescription drug and/or durable medical equipment business or will this transaction increase that interest? Black Friday shoppers hit Amazon hard for electronics, with Best Buy landing an anemic second and the other online retailers sucking wind. New poll to your right or here, for male readers: do you fear that past incidents could result in a new sexual harassment claim being made against you? The poll is anonymous, as always, and your comments are welcome. Recent headlines triggered me to review my past to make sure I wasn’t forgetting something that could have been misconstrued, leading me to think that others are similarly hoping they surface no repressed memories of previous impropriety. Next week’s poll will ask women if they’ve experienced work-related sexual harassment or assault. Note: I considered making both of these polls gender-nonspecific, but my assumption is that most of the examples are male-on-female and I didn’t want to dilute the denominator. The House passes the 21st Century Cures Act. A CDC study finds that the number of families struggling to pay their medical bills dropped 22 percent in five years due to an improving economy and those newly insured via the Affordable Care Act. Allscripts acquires Australia-based Core Medical Solutions. China-based investors finalize their acquisition of Lexmark and announce plans to quickly sell off its software business, including the former Perceptive Software. “Tricorder” company Scanadu announces plans to release consumer tools for vital signs, urinalysis, and saliva testing by the end of 2013. Reuters reports that several private equity firms have submitted revised takeover offers for Merge Healthcare. Constellation Software acquires Salar from Transcend Services, which had itself been acquired by Nuance. Vitera closes its hardware support business. Athenahealth announces plans to acquire Harvard’s Arsenal on the Charles complex in Watertown, MA for $169 million. CDC reports that 40 percent of office-based physicians use an EHR with at least basic functionality. Philips announces plans to acquire medical alarm and notification vendor Emergin. Dennis Quaid and his wife sue Baxter Healthcare for the Cedars-Sinai heparin overdose of their newborn twins. An entrepreneur offers a $10 million prize for developing software that can map the genetic codes of 100 people in 10 days for $10,000 or less per genome. Caring Voice Coalition, a drug co-pay charity, says it will likely shut down after HHS OIG finds that it sent patient data to its drug company supporters. Nuance turns in better than expected quarterly results as the actual financial impact of its June malware attack was less than it projected. Siemens Healthineers announces plans to go public on the German market in the country’s largest IPO in 20 years. Athenahealh names its third CFO of 2017. A newly unsealed lawsuit claims that Indiana hospitals falsely attested for $300 million in Meaningful Use money by failing to promptly provide patients with copies of their medical records. Here’s the recording of last week’s webinar titled “Making Clinical Communications Work in Your Complex Environment,” sponsored by PatientSafe Solutions. 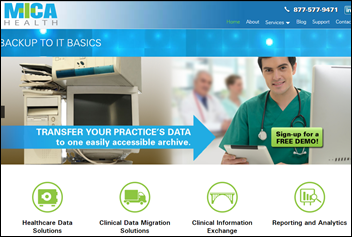 Nashville-based data management vendor Trinisys acquires Mica Health, which offers ambulatory EHR decommissioning services. Former Mica President Mike Justice will apparently stay on as Trinisys VP of business development. Companies offering healthcare point solutions are in for a rough ride since door-to-door sales in healthcare take 10-15 years. Immelt thinks AI will influence radiology practice, but says no great companies will focus exclusively on that. His shortest meeting ever (at five minutes) was driving to Epic and pitching the idea of GE buying part of Epic to Judy Faulkner, who simply replied, “No. No interest.” I can’t imagine a CEO in any industry who would have the brass to tell the CEO of GE to hit the bricks. GE considered acquiring Cerner, but didn’t think it was worth the $2 billion figure being bandied about (the company’s market cap has since risen to $23 billion). CERN’s market cap hasn’t been that low since early 2005, so GE’s acquisition interest must have been before then but after Immelt took the CEO job upon Jack Welch’s retirement in 2000. Hospital CEOs are still clueless about health IT and aren’t generating ROI, with the original goal being connectivity rather than value creation. He thinks they’ll gain interest in improving patient outcomes and value. Immelt said companies that started venture funds “have stunk at it,” admitting that they have been “company killers.” In healthcare, of course, GE’s direct acquisitions – which weren’t usually top-rated companies in the first place – gave it the “elephants’ graveyard” moniker as the place where previously good companies go to die. The average healthcare CEO who lost their job due to a merger or acquisition received a golden parachute of $25 million, much less than the $37 million average from a 2015 version of the same report. Dismissed trench warriors presumably were paid basically nothing for being cut loose through no fault of their own even though their need for income was probably much more acute than that of the aristocracy. WellStar West Georgia Medical Center (GA) will switch from Meditech to Epic in 2018. St. Luke’s Hospital Cardiothoracic Surgery (MO) will switch from EClinicalWorks to Cerner Ambulatory EHR in July 2018. New York Health + Hospitals hires Kevin Lynch (LA County Department of Health Services) as SVP/CIO. Here’s Vince’s look back 30 years at what was going on in health IT in December 1987, when George Michael’s “Faith” topped the charts and “Three Men and a Baby” foretold an epidemic of poor taste. Weird News Andy titles this article “DNR, R, DNR, EXP.” A 70-year-old diabetic man with “Do Not Resuscitate” (emphasis his) tattooed on his chest shows up at a hospital ED with an elevated blood alcohol level. Doctors considered his tattooed instructions invalid and started an IV, but covered themselves by also conferring with an ethics consultant, who told them they should honor the man’s request. The doctors wrote a DNR order and eventually also located a copy he had filed with the state’s health department. Meanwhile, the man died without further intervention. Deloitte names Definitive Healthcare to its Technology Fast 500 list of fastest-growing companies. Logicworks announces support for AWS Guard Duty, a new machine learning-based security service. Surescripts will exhibit at the AHIP Consumer Experience & Digital Health Forum December 5-7 in Nashville. T-System President and CEO Roger Davis receives Dallas Magazine’s Excellence in Healthcare Award for achievement in medical technology. Mazars USA expands its New York office with the addition of Elliot Horowitz & Company. Given GE’s track record in buying IDx, BDM, at al, imagine how well GE could have ‘screwed-up’ Epic. Not only did Judy make the right decision for Epic, but saved alot of clients a decade of stress and consternation. It was a good decision, and I’m not sure it took too much “brass”. Jack Welch has been lionized for so long that people have had some trouble seeing how he made a number of decisions that may have created some short-term profits, but over the long-term have put GE on a long, slow decline. And some, like GE Capital, that almost destroyed the company. There was a lot to be wary about regarding Welch and GE at the time Judy had this conversation, and there’s a lot to be disgusted about today in terms of how he’s personally enriched himself at GE’s expense. I don’t want to make the same mistake of lionizing Judy. This was probably a decision more about her not wanting to cede any control, which is an impulse that is at the heart of many mistakes that Epic makes, just as it’s at the heart of many of its better moves. She doesn’t see the future perfectly and there are some decisions she’s taken that aren’t exactly a paragon of ethics, either. This was nonetheless the right decision for Epic. GE would have wrecked the company, where at least the road that was taken gave Epic a chance to be the market leader for the past many years. With Kevin replacing Ed Marx as an employed (rather than contracted) CIO at NYCHHC; I guess the rule that Epic sites can only hire Epic experienced CIOs is broken. LA County Healthcare (Kevin’s current employer since 2010) has been all in on Cerner for some time. Thought that rule was idiotic anyway.